I haven’t for years (since I ended my sub to Creating Keepsakes scrapbooking magazine about 4 years ago). But, after visiting Jim’s family over Christmas and flipping through the pages of my mother-in-law’s Better Homes & Gardens and Country Living magazines, I became excited to start “reading” again. Those who know me, know that I can’t stand to sit down with a good book and just read. I’m far too impatient for that. I must always be multi-tasking. So, magazines are a great way to broaden my mind and explore various creative ideas — while watching TV, playing with the dogs, cooking, etc. at the same time. b) enjoy “reading” again, then I’m hoping to add to my magazine collection. Real Simple – Neat and clean; Great tips for general home organization. Country Living – My tastes are far from “country”, but this mag has great decorating & organizational tips. I was surprised by how much “non-country” info was in it! House Beautiful – Even more interesting home decorating ideas. Southern Living – Believe it or not, I like this one for the recipes and random tips. Everyday Food – I organize and save all the recipes others have given me (or recipes for foods I’ve tried at others’ houses) in a program called MasterCook. I’m searching for some new EASY recipes, and this mag looks like it’s right up my alley! Budget Living – our budgeting spreadsheets say that we’ll be completely out of dept (except for our mortgage) very soon! In addition to programs like Quicken and shopping at places like Goodwill, tips from magazines like this one have paved the way for us. 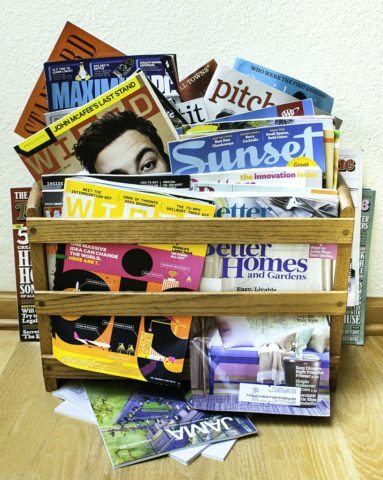 Updated list of my favorite house & home magazines for home organizing, de-cluttering and decorating tips.